A crucial part in the military junta's desire to win approval from the international community are its current ties to the United States. But the signs between Washington and Bangkok are somewhat ambiguous right now, writes Saksith Saiyasombut. It was a calm morning on the empty Hat Yao beach near Pattaya overlooking the Gulf of Thailand, but it was clear it wasn't going to stay that way for long. On the horizon, a good dozen amphibious landing vehicles appeared, racing towards the shoreline owned by the Thai Navy. Things were about to get louder and more crowded as the vehicles unloaded several units of United States Marines onto the beach as part of the annual "Cobra Gold", the oldest multinational military exercise in the Asia-Pacific region. Established in 1982, "Cobra Gold" was initiated to strengthen ties between the United States and their long-term ally Thailand, then under the semi-democratic rule of Prem Tinsulanonda, now the head of the Privy Council. It was the height of the Cold War and there were fears of a communist threat in the region. Over the years, the focus has shifted from fending off hypothetical invasions to multinational humanitarian operations. The exercise also involves other armed forces in the region either as participants or observers, including China and more recently Burma. These annual "war games" drills are seen as an essential pillar of US-Thai relations. 16,000 troops took part in the "Cobra Gold" military exercise in February when Thailand still had an elected, but deeply embattled civilian government. Now, almost half a year after the military coup of May 22 and with the military junta at the helm of the country and its fundamental dismantling of the political system, the question remains whether there will be another "Cobra Gold" in 2015. And what of Thai-US ties? The United States have warned of “negative implications for the U.S.–Thai relationship, especially for our relationship with the Thai military,” and suspended $3.5m of military aid to Thailand in the immediate aftermath of the coup (still a drop in the ocean compared to the current military budget of $6.07bn). There also have been demands that "Cobra Gold" should either be cancelled or moved out of Thailand in order to send a strong signal to the Thai generals. While these demands have been the only direct punishments--if you can call them that--from Washington it was still enough for the Thai junta to appear "unfazed" and offended at the same time. As mentioned previously on this blog, the military junta is desperately seeking approval from the international community to legitimise their rule. Despite the rather symbolic sanctions and condemnations by the US and the European Union who have suspended an almost-signed agreement on closer economic and political ties, the Thai junta seems to have found new friends in Burma, Cambodia (the former literally welcoming them with open arms) and also in China. 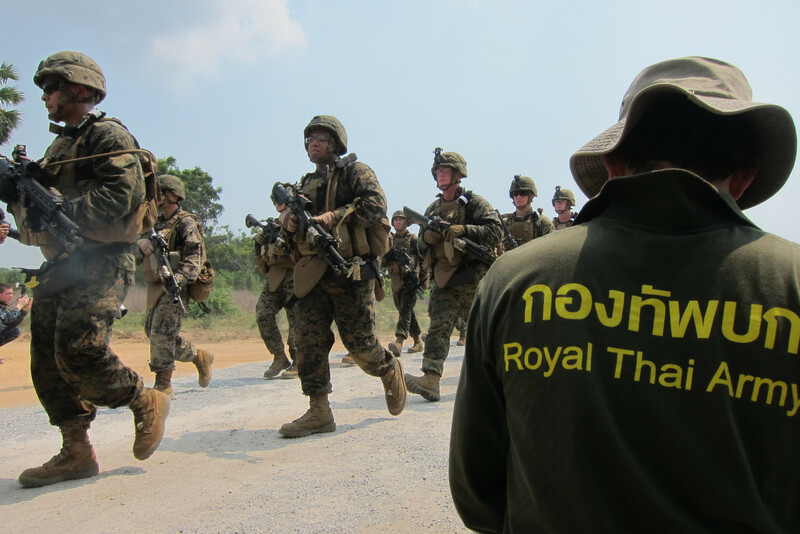 A spokesperson for the U.S. Embassy in Bangkok told VOA on Friday the so-called Cobra Gold 2015 exercise set for February will be "refocused and scaled down." The statement said "in light of the current political situation, the U.S. government has increased its focus on non-lethal activities, such as humanitarian assistance and disaster relief." Thai officials have recently denied that the war games would be affected by the May coup, the military's 12th takeover in 80 years, which has caused a minor rift in U.S.-Thai relations. Supreme Commander General Worapong Sanga-net said this week that 2015 was long ago set as the year for "light military exercises." He said the 2016 version will be designated as "heavy, and prove the exercises have not been affected by the coup." For his part, Worapong said the reduced U.S. participation was not an indictment of the military takeover. The US is also reported to have cancelled a “large-scale live fire exercise tied to a planned amphibious landing,” similar to the one described in the introduction. As evident in the comments of Supreme Commander General Worapong Sanga-net above, one key element of selling their view of international relations to the public is copious amount of spin, literally bending and distorting the truth. This was evident in the vastly different accounts of a meeting between Thai junta prime minister General Prayuth Chan-ocha and Japan's prime minister Shinzo Abe by their respective news agencies. Whether Thais fully believe them or not, the junta is eager to pose with foreign dignitaries and maintain a level of involvement on the international stage - such as forums such as the Asia-Europe Meeting in Milan earlier this month - in order to show that there is business as usual in Thailand. It seems that normalizing ties to the military government is the pragmatic way to go for many foreign diplomats, since they believe they can better influence the junta that way. With US Ambassador Kristie Kenney leaving Thailand at the end of this month (and her successor yet to be determined), the United States should take a hard look at the current situation and think about the long-term consequences of a change in their relations to Thailand. A stance that is too tough could drive Thailand into the arms of China while being too soft could be seen as an endorsement of the junta. But any response should demonstrate that things in Thailand are far from normal and the general's words about when they may return to normal should not be trusted.